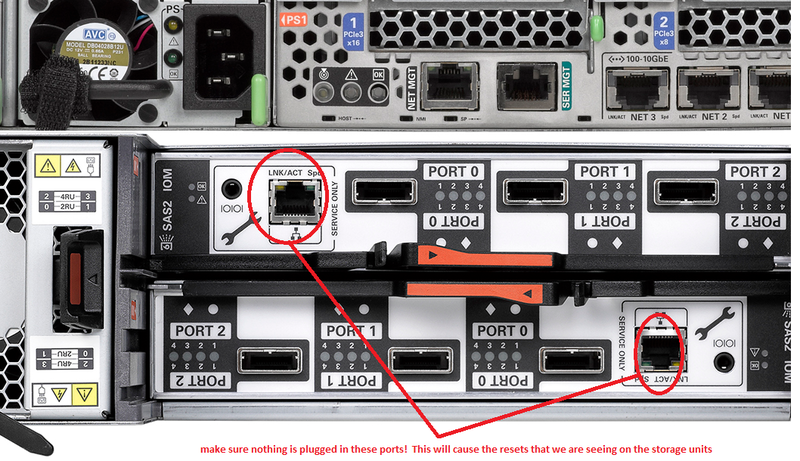 Is your ODA disk shelf randomly disconnecting from your compute nodes? I’ve been doing a lot of work with ODAs (Oracle Database Appliance) lately and I have to say that I’m VERY impressed. It’s amazing how smooth Oracle can make things when they know exactly what hardware and software will be on a machine. I can’t imagine how long it would take to patch an ILOM, BIOS, SSDs, HDs, OS, various controllers, Grid Infrastructure, and Database Software, etc. if you were doing everything by scratch. With an ODA all of that can be done by downloading two files and running a few commands. We did run into an ‘interesting’ situation where the disk shelf would randomly disconnect from the compute nodes. A restart of ohasd would bring everything back for a while (weeks, to sometimes hours), but it was really troubling to say the least. After trying a whole bunch of things, Oracle finally asked us to take a picture of the back of our disk shelves… See those service ports below? Someone, at some point in time, had plugged Ethernet cables into those ports. And that was the issue..
As far as we can tell those cables were plugged in during installation and it took over a year before the resets happened! The below is from an X4-2, your ODA might be a bit different. This entry was posted on Tuesday, August 18th, 2015 at 10:27 am	and posted in Code, Oracle Database Appliance. You can follow any responses to this entry through the RSS 2.0 feed. « Convert your database from a single instance to RAC using rconfig… Beware of CFS choice if you are using ACFS!